Giancarlo Esposito In Breaking Bad's Fourth Season Premiere: Be Afraid, Be Very Afraid. 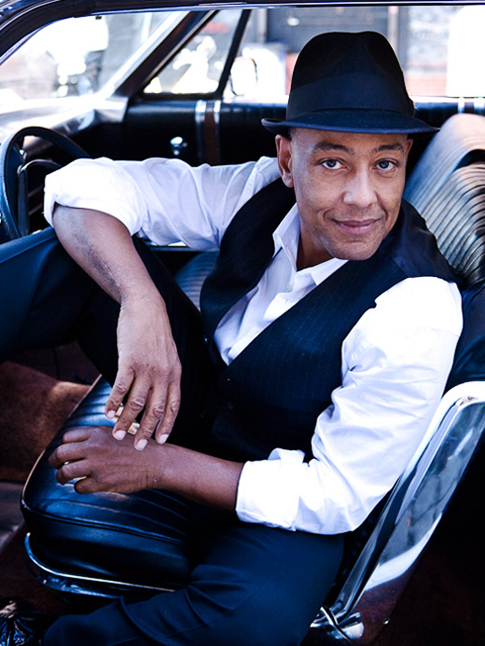 Actor Giancarlo Esposito. Portrait by Leslie Hassler. Giancarlo Esposito's performance in Breaking Bad's fourth season premiere was so electrifying that, as Woody Allen once said, "All the blood went out of my face and went to my brother." You can hold on to your seat, but that is no guarantee that you'll be able to stay in it. Everyone audibly groans, expecting it to be the usual technical difficulties. But it isn't. The commentator yells out, "Is there a doctor in the house?" And now we are afraid. Very afraid. Giancarlo Esposito's acting is so powerful that I begin to wonder if it may have killed someone in the house. The scene was so epic, so fantastically brutal, that a woman actually had to be carried out. And honestly, who can blame her? But in the end, everyone was fine, and the premiere continued. Actually, it was only fine for those of us in the audience. For those people left onscreen with uber-villain Gus Fring? They were totally on their own. Out of AMC's "Embarrassment of Riches" (LA Times) Breaking Bad, created by the brilliant Vince Gilligan, is the 120% show. Every aspect of the show, writing, directing, acting, music, and cinematography, is given the most care, attention, and talent possible. 120%. The premise: a brilliant chemistry teacher is forced to cook crystal meth after being given a terminal lung-cancer diagnosis to pay for his health care and to provide for his family, and slowly becomes someone even he doesn't recognize. If it sounds dark, well, it is. But there is a kernel of goodness that resonates throughout the cast, and throughout Breaking Bad itself. The show is startlingly funny, and episodes like "The Fly" are as well written as a Beckett play. Bryan Cranston has won the Best Actor Emmy Award three years in a row now, playing a man in a complete state of metamorphosis. But what kind of energy could one put up against his Walter White, a man of ethics, intelligence and scruples, placed in the most violent and unscrupulous of territories? Enter Giancarlo Esposito playing Gustavo 'Gus' Fring. Walter: I sat here yesterday, waiting to meet with someone. I believe that person was you. Gus: (friendly, professional) I think that you're confusing me with someone else. Walter: I don't think I am. Gus: Sir. If you have a complaint, I suggest you submit it through our email system. I'd be more than happy to refer you to our website. Walter: I was told that the man I'd be meeting is very cautious. I believe we're alike in this way. If you are who I think you are, you should give me another chance. And in a moment that is not scripted, something in the back of the manager's eyes shifts. It is a change so subtle, and so chilling, that I actually stood up, powerfully deflecting my gluten-free mac and cheese somewhere in the vicinity of the carpet and screamed, "IT'S HIM!!!" If Breaking Bad is like a Beckett play, then this episode is like Waiting for Godot, if Godot finally decided to show up. I called New York right away to talk to my partner in crime who is also the photographer who insisted that I watch the Breaking Bad series. "There's... this... Actor..." I said, trying to string together a cohesive sentence. "I know." Leslie said. "His name is Giancarlo Esposito. He's incredible!" I hung up and ran to the computer to check IMDB. It turned out that I (and probably you) had been watching him since Spike Lee's School Daze. And for years after that: Mo' Betta Blues, Malcolm X, Night on Earth, The Usual Suspects, Smoke, Bob Roberts, NYPD Blue, Homicide, The Street, Law and Order. Esposito's career began when he was eight years old on Broadway. About to be one of Rolling Stone's 10 most interesting figures of this year, Esposito's "overnight success" took four decades. Sitting outside with Giancarlo the day after the premiere, drinking iced coffee and wearing a stylish fedora, he looks like a man for whom all the pieces have finally come together. Extraordinarily joyous and affectionate, he beams, expresses himself with his hands like a true Italian, and bears little resemblance to his icier counterpart, Gus Fring. Though he is meticulous, disciplined, and beautiful. Like a dancer crossed with a gazelle. And he's sophisticated. My photographer friend jokes, "Miles Davis should start playing whenever he appears!" The night before, Bryan Cranston was on the red carpet being photographed with his Emmy-winning co-star Aaron Paul. Nothing unusual about that. Except now there was a third figure, Giancarlo Esposito. Esposito joined his place with the other two, and there they were, "The Axis of the Most Superb Evil." Amazing, given that Paul was supposed to die after the first season, and Giancarlo Esposito was initially hired as a guest spot, with what we can only assume would have been a short and bloody existence. Apparently, great acting really can save your life. Esposito's manager had said to him early on, after his first guest spot, "Oh, they're gonna kill you." But by this point, Esposito had fallen in love with the show, wanted to direct it, and had just finished his film, Gospel Hill, starring Danny Glover and Angela Bassett. "Well," he said, "If they don't kill me, I want to direct. And if they kill me, I want to direct!" But some performances are just too good too let die. The energy between Cranston and Esposito is so hot, and unexpected, it is hard to wonder how the scenery doesn't just, basically, explode. Says Esposito, "When you're with another actor and doing something very intense, often you pull them over to your side, or they pull you over to theirs. But if you stay in your own truth, you can play that perfect tennis match. I always want to bring my power, but not in a way that eliminates the whole game!" Giancarlo Esposito. Portrait by Leslie Hassler. Apparently, when they first met, Esposito saw Cranston on set and thought. "Ohhhh. I know who this guy is." Instant chemistry. What makes Esposito so terrifying as Gus Fring is what he doesn't do, what we know he is capable of, just by looking in his eyes. "I know from teaching, that actors want to act. Even the subtlest actors can do a little too much. So I thought to myself, "Can you bear it? Can you stand there, be present, and do nothing? And it all came together, with Gus. It was some of the first acting in my life where I was comfortable just being there." Someone as brilliant and wise as Walt, but as inexperienced in the ways of the drug culture as he is, needed a kind of mentor. Luckily Esposito has had some of the most wonderful mentors himself, like Paul Newman and Ellen Burstyn, who understood early on his powers as an actor. Says Esposito, "I found Bryan intriguing. Not only in how his part was written, but I was intrigued by him as a person, as an actor. I look in his eyes, watch his top spin, and can almost be inside his brain. And I think, what would it be like to be three steps ahead of him?" A villain with a gun is just a man holding an automatic weapon. But a truly great villain works from within. He is a villain of the mind. Gus has a love for Walt, and strangely, that makes him even more terrifying. Esposito says, "I try to play him with compassionate understanding. I think, "I would really like to help you be a better human being. (laughs) I would like to help you find yourself, because you're lost." What about the fact that when he plays Gus, many of us want to literally faint? "I allow him to just be available, attentive, and listening. I can hear my breathing. I don't do anything that is false. I want to create Gus. He is a real man. This guy is so scary to people, they would be shocked to know that as I play him, I'm thinking about love. (laughs) I don't ever think about him being frightening. I think of him as being formidable." But when Esposito saw the script for the first episode of the Fourth Season, "I physically shook." he said. "I read it, I comprehended what I had to do. And then I had to put it down for three days." Esposito's best friend from eighth grade, Eygie, after seeing the premiere exclaimed, "Your eyes!!" In the fourth season opener, he is communicating something very clearly to Walt and Jesse through his actions, but if you look, it's all in his eyes. They reveal multitudes. Multitudes that might never let you sleep again, but it'll totally be worth it.